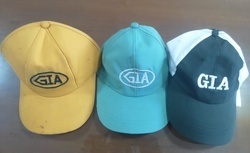 Prominent & Leading Manufacturer from Gurgaon, we offer promotional cap. Terupati Engineering works presenting commendable Design Promotional Cap we have established ourselves as well-known name in the market. This array of cap offered by us is manufactured in line with the standards and parameters of quality defined by the industry using the best available quality fabric. The quality of these caps is thoroughly checked to dispatch the defect free assortment to our customers.